We continue to share cartoons created for other organizations. 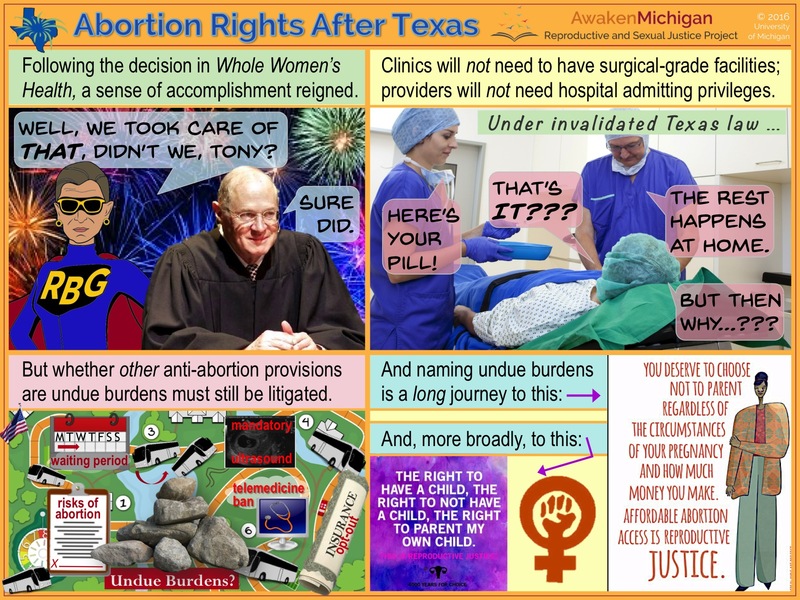 This second post on abortion jurisprudence – published following the Hellerstedt decision – was created for AwakenMichigan: Reproductive and Sexual Justice Project. Frame 1 depicts, of course, Justices Ginsburg and Kennedy. For RBG’s portrait, we used an image from the marvelous coloring book created by Karen Cox/She Knows. Frame 2 shows an abortion clinic administering a medication abortion in the surgical-grade premises that would have been necessary had the Texas law been upheld. Frame 3 lists other common abortion restrictions – most of which are currently in force in Michigan. Whole Woman’s Health v. Hellerstedt does not invalidate any of these restrictions; further court challenges will be necessary to determine if they constitute undue burdens. The right to have a child, the right to not have a child, the right to parent my own child. This is Reproductive Justice. 4000 Years for Choice. You deserve to choose not to parent regardless of the circumstances of your pregnancy and how much money you make. Affordable abortion access is Reproductive Justice. We thank Heather Ault of 4000 Years for Choice for permission to use her work. The latter panel is from the Repeal Hyde Art Project. The image is licensed under a Creative Commons license. We changed this image by cutting off the far right edge and manipulating the contrast for increased legibility. Source: Graphic. Abortion Rights After Texas (2016). Categories: law, reproductive justice | Tags: abortion, cartoons, history | Permalink.